Robert is 17 years old and has been riding motorbikes since he was 3. By the age of 6 he was doing grasstrack. His 9th birthday saw him with a brand new bike a ktm85, however he now had gears and a clutch to contend with, as the previous one was a twist and go. Robert took it all in his stride and aside from the occasional “mishap” was soon back to his winning ways. 2007 saw him travelling the length and breadth of the UK competing in bigger competitions. On the 15th Sept 2007 he travelled to Swingfield in Kent for the British Grasstrack Finals, as it was his first national Final he was understandably nervous. At the end of a thrilling meeting Robert missed out on the No 1 spot by a single point. In 2008 the British Grasstrack Finals were in Leamington-Spa, Robert progressed to the final, but his bike got sabotaged, but with a lot of determination he rode his heart out but sadly came in 2nd. Also gaining his 250cc Speedway Licence. 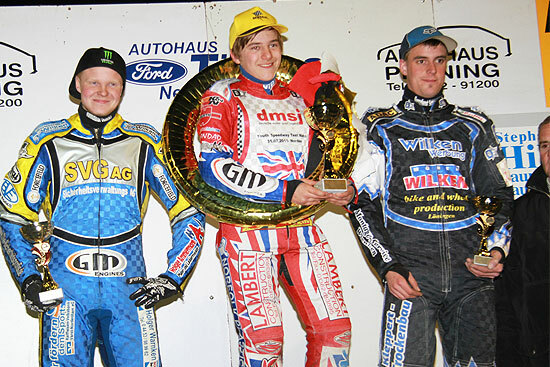 2009 saw Robert compete in the British Under 15s 250cc Speedway Championship, with 7 rounds across the country. With a good showing in the upcoming races in the series earnt him a spot to ride in some demonstration races at Cardiff Millennium Stadium British Grand Prix. In his final round of the under 15s Speedway Championship at Workington saw him on level points for the Championship he ended up having a run-off with 14 year old Brandon Freemantle but just missed out. In the October we travelled to Danebury for the British Grasstrack Championship, to which he won all his rides to Become British Junior No 1. 2010 was yet another good year for Robert as he has regained his British Junior Grasstrack Title and also won The British under 15s, 250cc Speedway Championship. 2011 saw Robert complete the transition from the 250cc to the 500cc speedway engine, but unfortunately due to his age he could not compete on it. Although during the season he has been going out doing some demonstration laps at Rye House and obtaining some decent times, matching some of the Premier League times. We also took Robert over to Germany to race over there, due to his age it was on the 250, but he was the only British rider there and he came back with a No1 podium position and a trophy nearly as tall as he was. By 2012 Robert has obtained a German licence and was competing in The Under 21 Championship.